Yeah, but: A simple thing done (almost) perfectly. 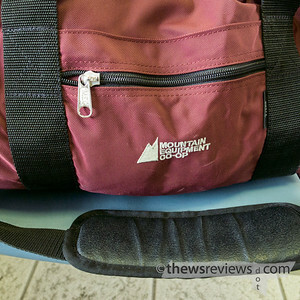 The Long Version: The MEC Duffle Bag is a very simple thing that's done well. Available in four sizes, they're basically just heavy nylon barrels with a strong zipper and straps. There's one side pocket and grab handles on both ends, and the construction is absurdly good for the price. I have the Small (pictured) which is $30, as well as the more expensive ($42) Large. No, they aren't waterproof and won't rival the Base Camp duffel, but I've used them for years and they've never let me down. The Small duffel is what I use whenever I don't need an actual suitcase, so it's been thrown in the luggage compartment of more Greyhound buses than I can count. It's capable of handling a few days' worth of clothes and an extra pair of shoes, and the small side pocket is all I need for stashing a few odds and ends that I don't want getting lost in the cavernous interior. If I'm just going to be away for a couple of nights then I can usually tuck my shoulder-slung camera bag into it as well, although that comes out and rides with me instead of being treated like cargo. 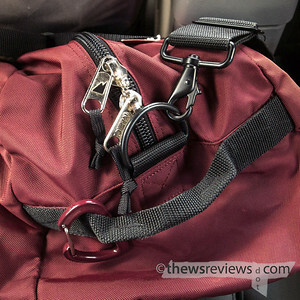 The zippers on the bag are massive, have never shown signs of being strained, and all of the metal hardware is robust. The wide nylon strap handles are sewn all the way around the circumference of the bag; the grab handles on the end are folded and stitched to make them easy to use. The strap is the sole weakness of the design: even adjusted to its longest length, it's just a bit too short to easily sling when the bag is full. The Small bag is capacious without being too unwieldily, and the Large bag is huge. In fact it's so large that I hardly ever have a reason to use it, and I no longer remember when or why I bought it. But there was a six-month period, many years ago, when I needed to use a laundromat some distance from my apartment. The large duffel was instrumental in that, and would have no problem handling the week's worth of groceries that I'd pick up while the machines were doing their thing. In fact, I think it was probably insulted by how lightly loaded it was. 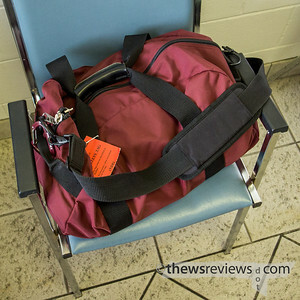 Seeing my Small duffel in action over a couple of weekend trips even inspired Penny to pick one up for herself. That was about five years ago, but these days hers doesn't see nearly as much action as mine. She finds her large backpacks are easier to carry than the Duffel, and also has a really good four-wheeled carryon suitcase. Eventually I might inherit her MEC duffel bag, but since that would mean I've worn out and retired mine, I just don't see it happening.